Why #CoffeeEDU should be part of your PD! | Learn. Lead. Inspire. Why #CoffeeEDU should be part of your PD! As educators, it is our job to continue to grow, learn and challenge ourselves. One way that I have chosen to not only grow my PLN but to enhance my PD is through monthly meet-ups at our local coffee house. These meet ups are better known in the world of education as CoffeeEDU! For those who are not familiar with #CoffeeEDU, here is a brief definition; CoffeeEDU is a one-hour gathering for educators. CoffeeEDU is not about promoting a product or organization, it is about expanding your PLN in a face to face meet up. 2. Learn - I walk away from each gathering with new ideas that I can bring to my classroom. One of the newest ideas that I am most excited about is finding ways to use Scratch in my Social Studies class. Stay tuned as this becomes a reality in the coming months! 3. Grow - One idea that I advocate for with all educators is that they step outside of their comfort zone. CoffeeEDU allows people to do this by just showing up! Taking a leap and sitting with new people allow us to do more than we ever imagined we could. 4. Be Inspired - The stories that people share have been so powerful. Listening to other educators share the work of their students, or discuss their passions about teaching and learning, has been fantastic. When I see that look from other educators, it pushes me and inspires me to do more, or become "better". There have been many times where I walked away from these gatherings with a newfound love of teaching. 5. COFFEE!!! - I mean honestly, who doesn't love to sit back and have a cup of coffee while discussing relevant topics to you? 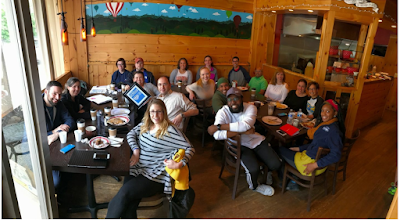 Our #CoffeeEDU North New Jersey Crew, such an awesome PLN! Want to join this great Crew for our next #CoffeeEdu??? Contact me for more information! Get Involved --> Find a CoffeeEDU near you or start your own! Please feel free to share your #CoffeeEDU experiences and PD story in the comments section. Formative Assessment Tools That Work! Learn. Lead. Inspire. © 2015. All Rights Reserved.